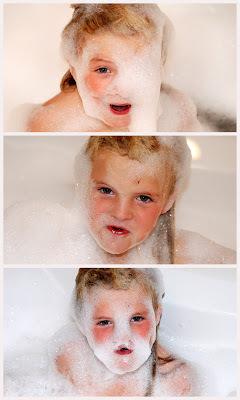 The girls enjoyed a long bubble bath and transformed themselves into "bubble monsters" They were so adorable so I had to take pictures of them. I love Jade's big blue eyes in contrast to the white bubbles. I love the faces she pulls. I love the deepness of Ivy's eyes. I love Ivy's funny little smiles. darling girls! I really need to start taking more pictures--you do such a great job! Those are great bubbles! What brand do you get?